After embarking on the construction of the "Autobahn" motorway in 1933, development of a "people"s car - Volkswagen" was declared at the following year"s Berlin motor show. The "People"s Car" project was immediately carried out and in February 1936, Dr. Ferdinand Porsche presented his first prototype, which was the very root of the fabulous Volkswagen "Beetle". However, along with the outbreak of the World War 2, all manufacturing of the Volkswagen was immediately turned to military production. It was in January 1938, when the German Defense Forces presented specifications for a military version of this practical vehicle. In November of the same year, a prototype model was completed and it was officially designated the Pkw. K1 "Kubelwagen" Type 82. The vehicle used a light but sturdy, monocoque construction with foldable canvas top. The rear mounted, air-cooled 4 cylinder engine had a displacement of 985cc and output of 23.5hp at 3,000rpm, propelling the car up to 80km/h. The four wheels were supported by a torsion bar suspension system. The Kubelwagen was initially deployed to the Reconnaissance battalions. 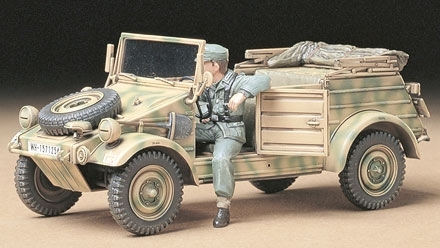 With its reliable engine and heavy duty suspension, the Kubelwagen immediately came to be used by every unit, from the scorching desert of Africa to the frozen Russian Eastern Front. About 51,000 Kubelwagens, including several variations, were rolled out from the factory by the end of WW2.